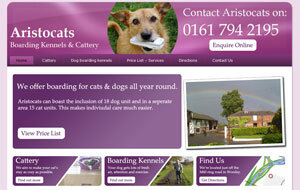 Aristocats Dog Boarding Kennels and Cattery is a family run business based at Wardley Grange Farm, Worsley that has been running for over 25 years. They offer boarding for cats and dogs all year round. The facilities are licensed & inspected annually in accordance with the latest government legislation. In order to develop the business further, Tony Aldred commissioned Formability to build a website for Aristocats. Working closely with Tony, Formability built a website that met his requirements. We launched the Aristocats site on a Thursday, and on the Friday Tony had their first sale off the website almost paying for the cost of the site! Following the success of this site, Tony commissioned the building of a website for Wardley Farm, and has since asked for further updates to the Aristocats website. The website currently receives over 950 visits each month, with an average time on the site of nearly 3 minutes, with a bounce rate of only 25%. Tony Aldred says "I have found Formability to be creative and at the same time adaptable to the customer's needs and desires".